Columbia Basin Care, a long-term care facility, has partnered with the Head Start preschool program to encourage socialization across generations. Each week the youngsters join the residents for arts, crafts, hugs and hellos. 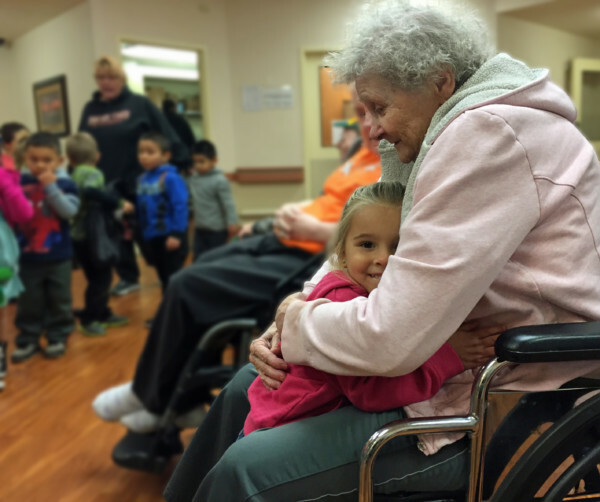 These visits from children, ages 3 to 5, brighten the day for the elderly residents. Columbia Basin Care, located in The Dalles, is the region’s only community-owned, not-for-profit skilled nursing facility. Founded in 1964, Columbia Basin Care is home to about 60 residents and employs over 80 people. Head Start is a national program formed in 1965 to provide early childhood education, health and nutrition to low-income children. The local program is managed by the Mid-Columbia Children’s Council. By 2030, one in every five people will be 65 or older, according to the U.S. Administration on Aging. With the changing demographic, sociologists and psychologists note that interactions between young and old are more important than ever. Much is to be gained from intergenerational interaction, they say, most notably a decrease in loneliness among the elderly and an increase in empathy among youngsters. Boredom and loneliness is a challenge in any long-term care facility, particularly if residents are frail, have limited physical ability, and require significant assistance. Numerous studies have linked social interaction with decreased loneliness, delayed mental decline, and lower blood pressure in the elderly. Socializing across generations has also been shown to boost mood and increase conversation among older adults. In turn, research shows children who have early contact with older people are less likely to have a negative view of the elderly. Intergenerational interactions also enhance children’s social and personal development. Betty Blackwell, 90, is all smiles and awe. “Well, they’re cute!” she says of the swarm of youngsters, and a moment later young J’Haylee leans in for a hug.